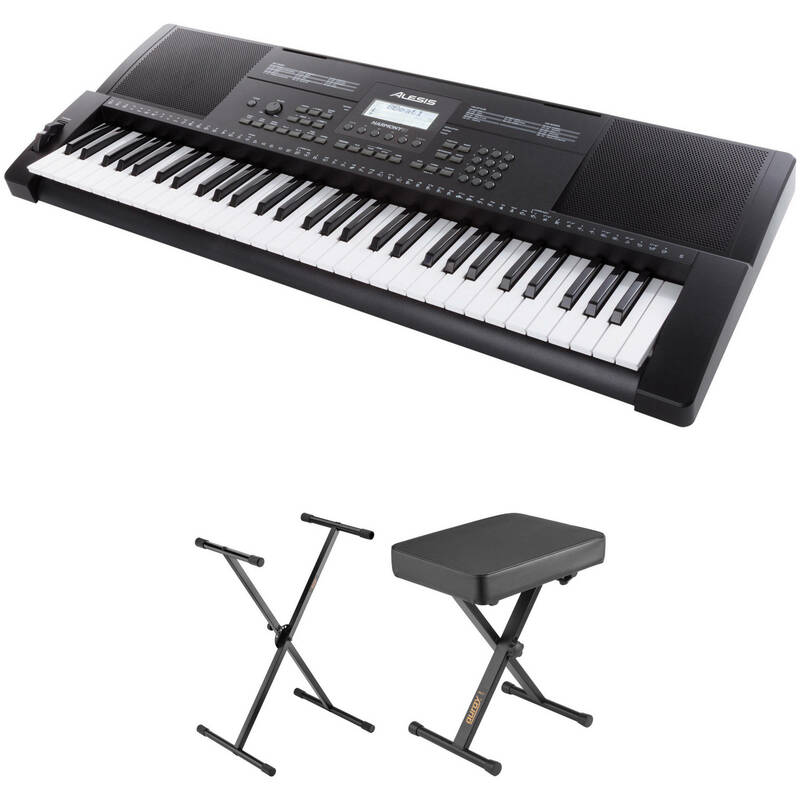 The Alesis Harmony 61 Keyboard with Stand and Bench Kit from B&H includes the Alesis Harmony 61 portable keyboard with built in speakers, the Auray KSPL-1X Single-X keyboard stand with pull lock, an Auray PBS-17 X-style piano bench, a power adapter, and a music rest. This kit can be used by a beginner or a seasoned performer to record and create songs in a wide variety of genres. The Harmony 61, 61-Key Portable Keyboard with Built-In Speakers from Alesis features 61 velocity-sensitive keys with adjustable touch response, two built-in 5W speakers, and over 300 realistic built-in sounds such as pianos, strings, brass, woodwinds, percussion, mallets, guitars, synths, and even sound effects. It can be used to record and create songs in a wide variety of genres. The Harmony 61 has 100 built-in songs with easy-learning tools and 100 built-in accompaniment rhythms. You can layer multiple sounds together in "Layer" mode, or split two sounds across the keyboard in "Split" mode. Featuring a large LED backlit screen with a grand staff that displays the current notes being played, the keyboard also includes a complete chord dictionary. This is suitable for students learning to read sheet music, and it saves time for composers who need to quickly figure out chords. Furthermore, Harmony 61's lesson mode enables you to learn any of the 100 included songs. Each song is split into three graded lessons. In the first lesson, you learn the rhythm; in the second, you learn the melody; and in the third, you learn to play the melody and rhythm together. After each lesson, you are graded, and the keyboard indicates when it's time to move on to the next lesson. Additionally, you can play along with your favorite songs by connecting a tablet or mobile device to the keyboard's 1/8" auxiliary input. Three months of Skoove Premium is included with the Harmony 61 keyboard, which provides in-depth online piano courses that adapt to you and give you feedback. Finally, develop your repertoire on your own time and at your own pace with the keyboard's catalog of music, which includes monthly updates of new music. You can also up your piano game with new music theory tips and tricks. The KSPL-2X Double-X Keyboard Stand with Pull Lock from Auray is a keyboard stand that holds up to 154 pounds and features sturdy metal construction for strength and enhanced stability. A spring-loaded pull lock with five preset heights makes it easy to adjust. There are non-slip end rings on crossbars to ensure the keyboard doesn't move once it's on the stand, and additional traction for the feet to prevent the stand from shifting. The removable end caps allow you to mount a 2nd tier (sold separately). The KSPL-2X's sturdy metal construction and double-X design provide solid stability for your keyboard or gear and support for up to 154 pounds. It conveniently folds up for easy transport and storage. The spring-loaded pull lock with five preset heights allows for precise adjustment. Whether you prefer to play while you're sitting or standing, you can position your keyboard at a comfortable height. The KSPL-2X accepts a second tier (available separately). The end caps can be removed so you can install the second-tier add-on. Non-slip rubber rings on the crossbars ensure that your keyboard doesn't move once it's on the stand. They also offer additional traction for the feet to prevent the stand from shifting. The small black Auray PBS-17 is a lightweight X-style piano bench designed to provide stability, comfort, and support for keyboardists and pianists on stage, at home and rehearsals, or in the studio. Its strong steel frame supports a weight capacity of up to 300 lb. Courtesy of three height positions, the bench can be adjusted from 18.5 to 20.5” tall. The 17 x 12” seat features 2.5” of high-density foam for padding that offers both comfort and support, even for long sessions. Setup is simple and quick due to the two locking knobs and X-style design, which folds flat to minimize space during transport and storage. Three positions yield a height range from 18.5 to 20.5"
Box Dimensions (LxWxH) 39.0 x 16.0 x 6.5"
Box Dimensions (LxWxH) 40.0 x 19.0 x 4.0"
Box Dimensions (LxWxH) 25.1 x 13.4 x 5.9"